How can you recycle plastic bottle caps? Enjoying art projects and making crafts with kids are fantastic ideas for recycling, Michelle Stittzlein says. 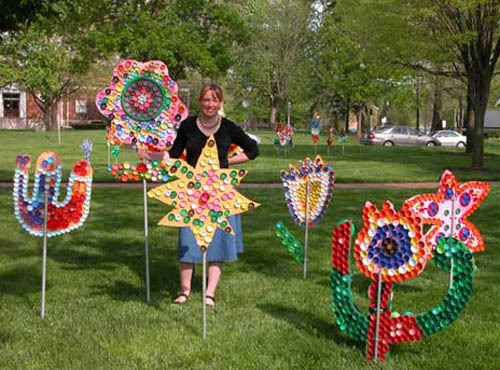 She offers workshops and demonstrations for children and their parents teaching to create colorful sculptures and art installations with plastic bottle caps. Lushome shares her fabulous recycling ideas to inspire the readers to turn colorful plastic caps into beautiful artworks. Recycling bottles and caps is a Green way to make cheap decorations for kids rooms. 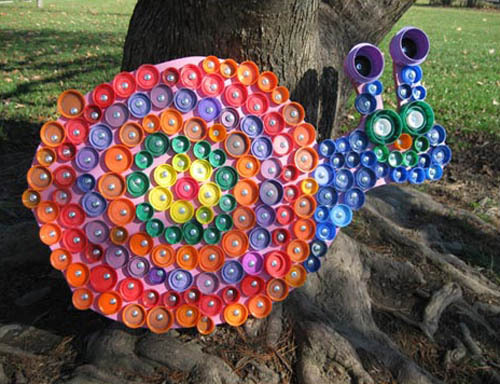 Plastic bottle caps are a perfect material for decorating backyards with handmade designs in bright colors. Simple, easy for kids crafts make wonderful garden decorations. You can create beautiful flowers and funny characters with bottle caps. 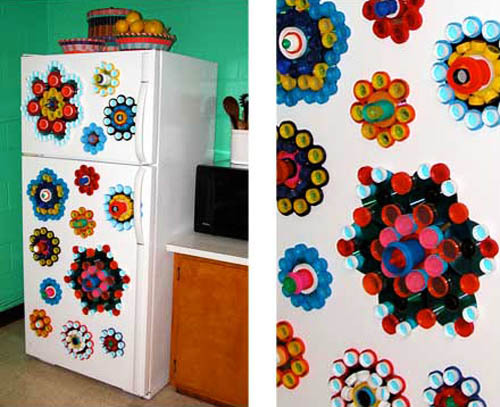 Colorful wall murals for kids rooms and unique gifts are great ideas to recycle bottle caps. Crafts can teach children the concepts of Green living in a whimsical and playful way. 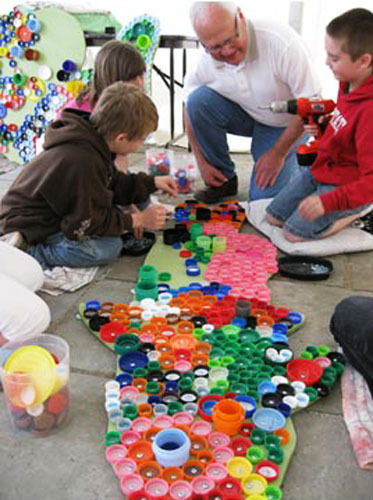 Plastic bottle caps are interactive kids toys that inspire and stimulate the imagination. 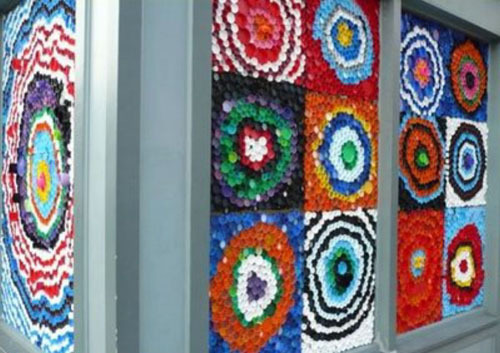 Use a chance to incorporate this artistic way of recycling bottle caps into your home decorating. Colorful designs bring fun and joy into kids life. 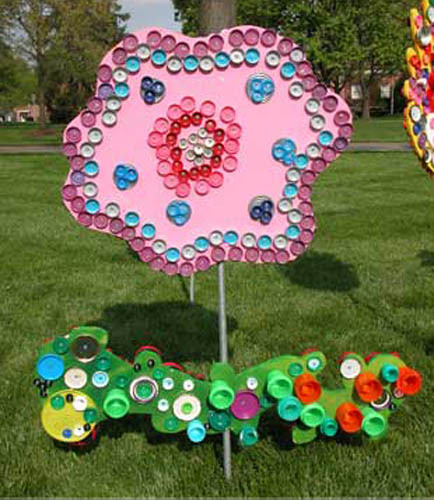 Recycled crafts and art projects teach children to act eco-friendly, be resourceful and creative. If you are wondering how to recycle plastic bottle caps, look at the images below and read Michelle’s book Bottlecap Little Bottlecap. It is about recycled crafts for kids and colorful art projects that dramatically change the way people think about plastic bottles. Colorful wall murals and beautiful mosaics give an artistic touch, bright color combinations and depth to your kids’ rooms. 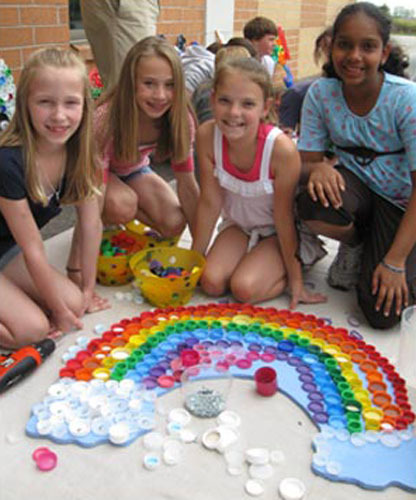 Bottle cap recycling offers exciting, money-saving, fun craft ideas. The cheap home decorations and unique gifts teach children creativity and resourcefulness. They brighten up kids life and add amazing art installations to backyard ideas and kids rooms decor. 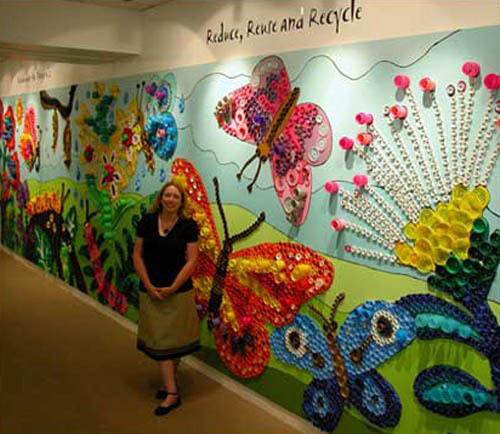 Michelle Stitzlein, www.artgrange.com/ creates gorgeous recycled crafts, artworks, and decorations for children playgrounds. 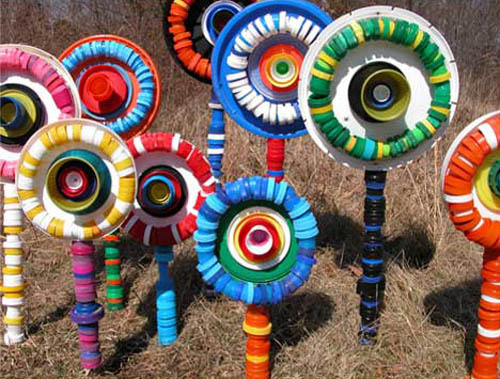 She uses painted plywood or thick cardboard as a base for her creative art installations creating bright images with plastic bottle caps in various colors. You and your children can follow her example and create bright decorations while protecting the environment and saving money on commercially produced decor items. Handmade home decorations will adorn kids rooms, a backyard play area or your garden, bringing more color and creative design ideas into your home. The technique for making these fantastic decorations is smart and straightforward. It works for recycling bottle caps and small plastic containers. Paint, small screws or glue gun and lots of colorful bottle caps are all you need to turn an ordinary piece of plywood or thick cardboard into art. Your kids will be so happy to participate in recycling activities. 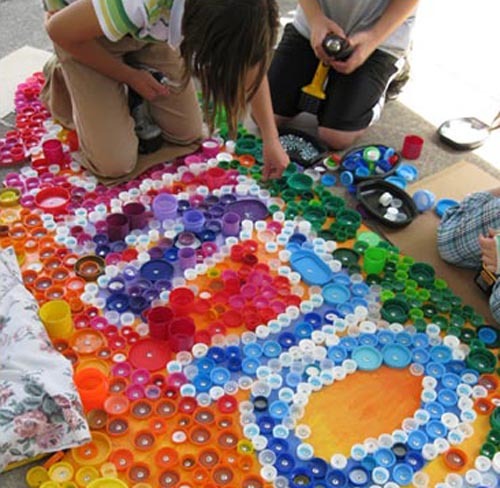 Children are eager to create something unique like mosaic decorations that recycle bottle caps or small plastic containers. 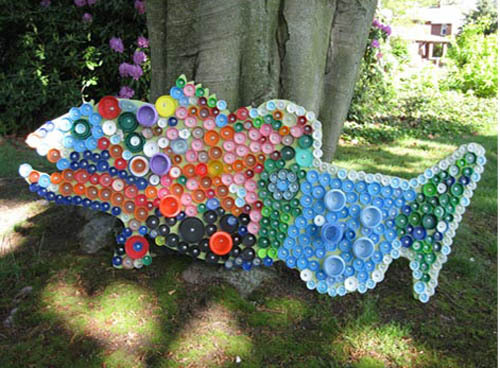 The artistic, creative and surprising ways of plastic recycling stimulate kids to drink more water and milk, collect bottle caps for art and craft projects. Recycling is about seeing the beauty in ordinary objects and appreciating simple things. Children will become healthier and smarter while developing their talents and enjoying recycled crafts.